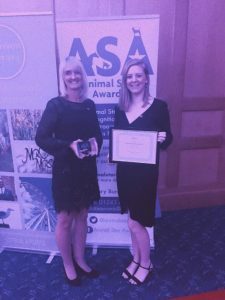 ASA ‘UK Animal Charity of the Year’ award winners! The Bumblebee Conservation Trust was delighted to be awarded the ‘UK Animal Charity of the Year’ at the inaugural Animal Star Awards, which took place at the Mandalay Hotel in Guildford on Saturday 3 November 2018. Helen King, Communications Officer and Laura Shakespeare, Project Development Officer, attended the ceremony to pick up the award on behalf of the Trust. Over 200 people attended the ceremony, hosted by founder Mary Burgess and BBC Surrey radio presenter Mark Carter, with our award being presented by Dave Gardiner from Evergreen Insurance Services. Gill Perkins, CEO said “This accolade is fantastic recognition of the hard work on a day to day basis, staff, volunteers and members deliver and the great support the Trust gets from a wide range of people. Hopefully, this is the first of many awards for the Trust”.